We’ve seen a ton of posts online over the winter season of hockey players taking on some of the nicest views in the world on skates. The setting has typically been what’s stood out most about each one, but we’ve finally found one that’s more focused on the actual ice. Well, at least what’s under it. David Vencl, a free-diver from the Czech Republic took on winter’s harsh elements in the most courageous way possible by swimming under ice in Lake Malida's frigid water. To top it all off, someone actually skated over him has he sliced through the water. It made for truly one of the most bizarre scenes hockey fans will probably lay eyes on. Judging from his Instagram page this all wasn’t new to David. The man clearly has a thing for freezing weather conditions, considering most of his pictures are of him taking on the coldest water possible. His Insta page also says he’s a nutritionist and diving champion so we’d imagine David has a pretty good idea about what he’s doing at this point. And it looks like making the actual hole in the ice is his favourite part! 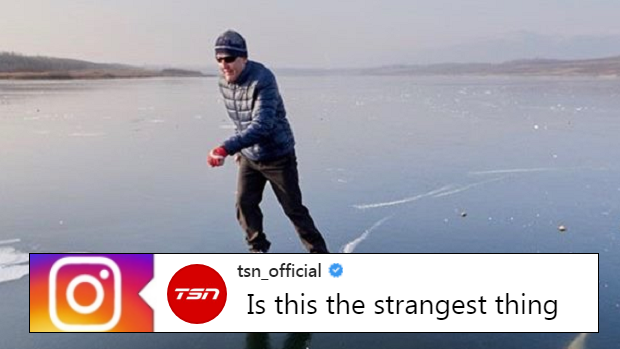 We really think that the NHL needs to consider playing its next Winter Classic series on a pond because seeing this dude under all the action would be pretty darn cool.